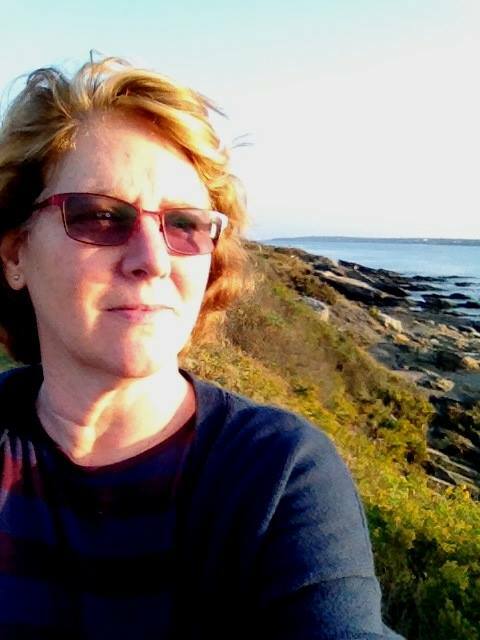 The Armory Center for the Arts receives the 2015 National Arts and Humanities Youth Program Award. Before last week high school senior Dalon Poole had never traveled away from his hometown of Pasadena, California, or been on a plane, much less gotten a hug from the First Lady. These were some pretty big life events for this aspiring teen photographer. Just like the Jimmy Stewart character in the classic Frank Capra film “Mr. Smith Goes to Washington”, Dalon has been changed forever by his visit to the nation’s capital. 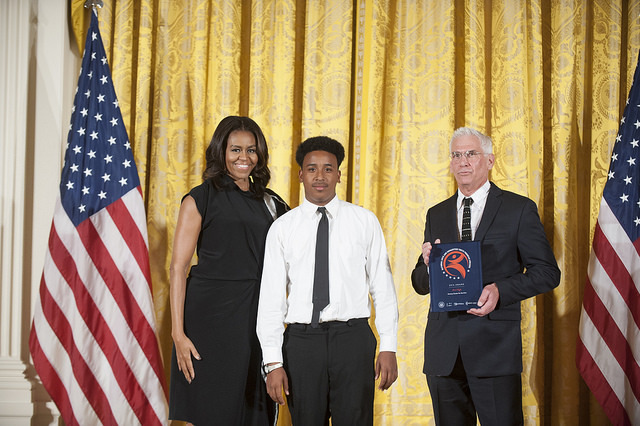 Dalon’s trip to Washington, DC to visit The White House was the result of his participation in the Armory Center for the Arts’ “Art High” program, which recently won the 2015 National Arts and Humanities Youth Program Award—the nation’s highest honor for these programs. 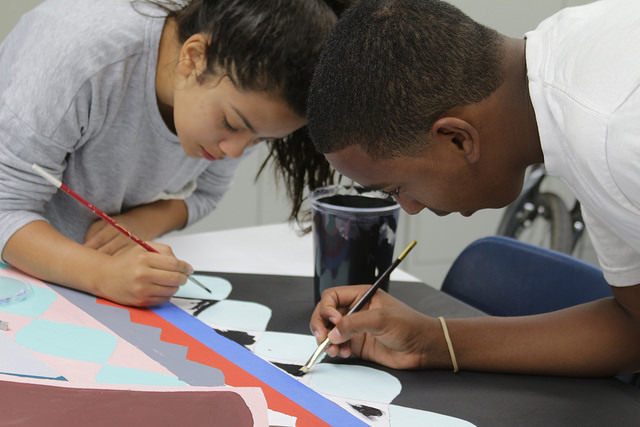 Armory Art High student Dalon Poole (right) and friend create a collaborative mural on panel at the La Pintoresca Teen Education Center in Pasadena. 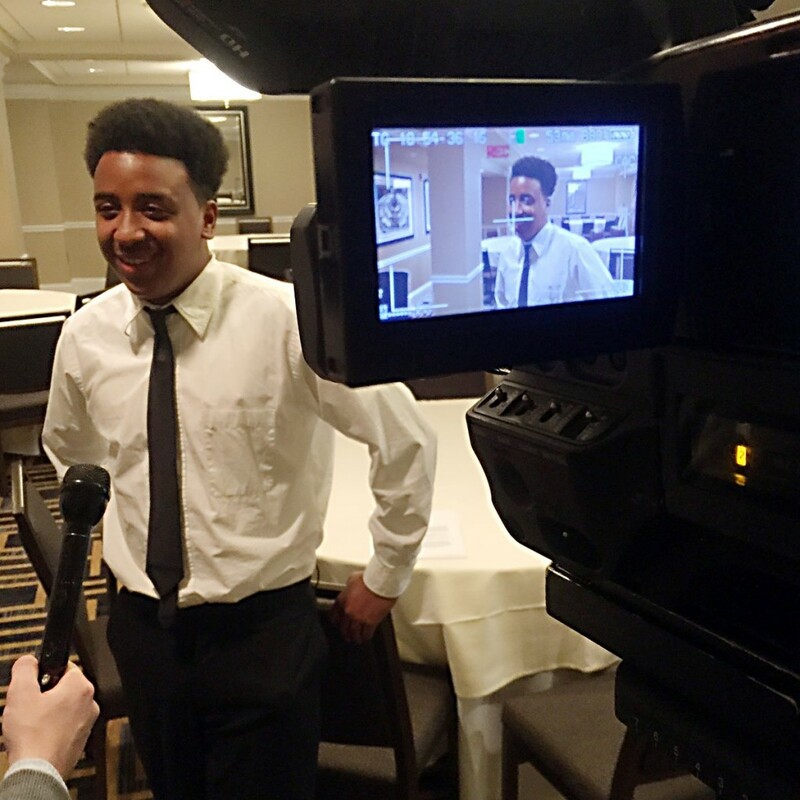 Dalon said the night before the award presentation there was a formal dinner held at the hotel where all the teen recipients with their respective organizations were staying. They came from around the country to attend the event and the dinner gave everyone a chance to meet one another and socialize. The next day they went to The White House for the live-streamed event where Michelle Obama welcomed the teens and spoke about the honor they were receiving and the importance of arts education. She said to the audience “This is a big deal. You all inspire me. Arts education is not a luxury. It is a necessity.” What was it like for Dalon to meet the First Lady? 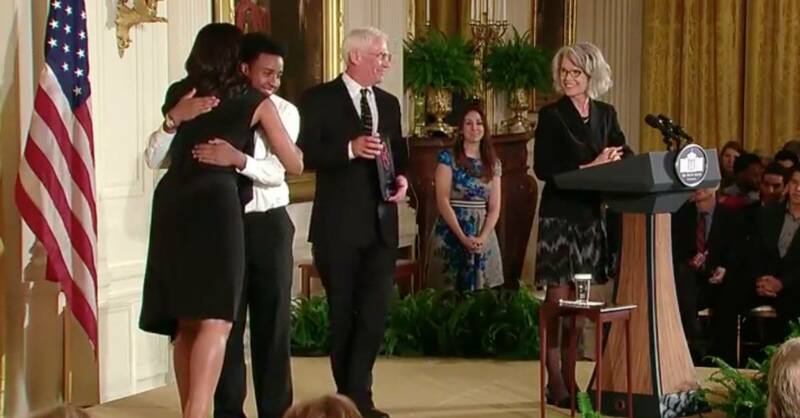 Dalon lives with his grandmother and at first didn’t want the rest of his family to know about the award, but by the day of the event everyone had found out and watched him on stage with the First Lady. They have been calling and congratulating him non-stop all week. His friends at school were all excited for him too, and proud that their classmate is a bit of a celebrity. As he walks through the halls of Rose City High School, a continuation high school in the Pasadena Unified School District, they slap him on his back and have nicknamed him “Mr. White House”. Jon Lapointe, Armory Communications Director says “The Armory’s Art High program gives teens not only the vision, but the skills to build a future for themselves, their families, and their community.” Before he enrolled in free Armory photography classes two years ago, Dalon took pictures with the only camera he had — his phone. Through Art High he has learned how to operate a real camera, and he was mentored by a professional artist, Armory Teaching Artist Joe Sanchez. In addition to photography, Dalon began taking free Armory graphic design classes at La Pintoresca. 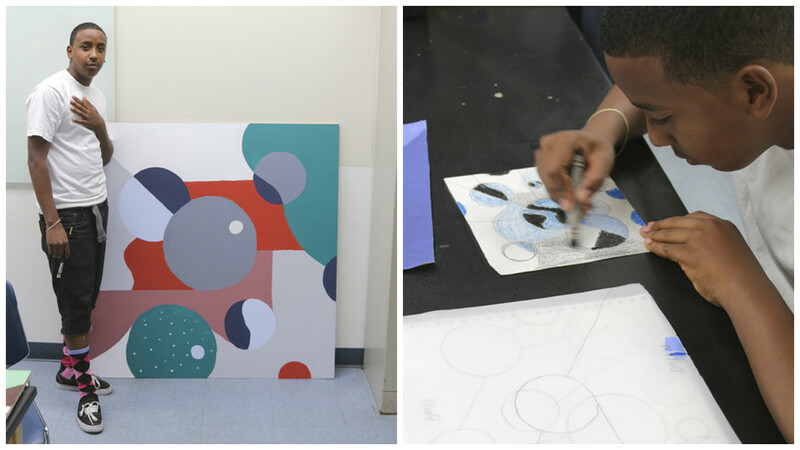 In 2015, the Armory nominated Dalon for the Pasadena Art Council’s Young Artist Award, which he won. Dalon used part of the $1,000 award to buy his first real camera, which he used as a paid Summer intern taking photos for the City of Pasadena’s Parks Department. Dalon Poole with his work supervisor, Yuriko Montes, Recreation Services Specialist, City of Pasadena in front of his artwork. Next year will bring community college for Dalon. Beyond that he doesn’t know where life will take him, but he does feel changed by this experience and feels positive about his future. As Dalon gets back to work we run into his supervisor, Yuriko Montes, who clearly has a soft spot for the teen and praises him for the incredible growth he has shown this year while Dalon squirms a bit in embarrassment. She comments on how improved his academic focus is, how reliable he has been and even she is basking in the glow of having an employee who has met the First Lady. That’s the thing about an experience like this. It rubs off on everyone you know. “Of all the people, I got chosen. 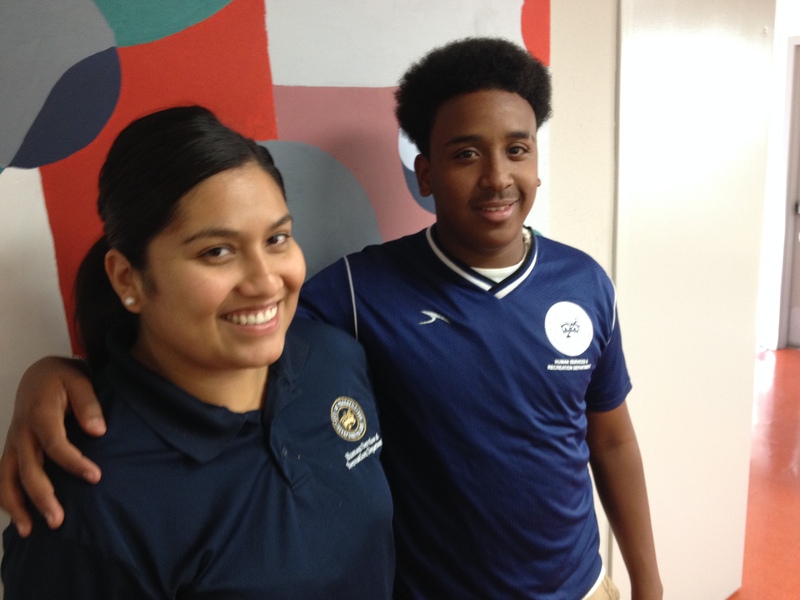 I felt joy inside.” Dalon says. Now when someone asks him what he does he says “I’m a photographer.” When I pressed him and asked if he is an artist, he said “Well, photography is an art so I guess I must be.” It’s real now. The Armory builds on the power of art to transform lives and communities through creating, teaching and presenting the arts. It originated as the education department of the Pasadena Art Museum in 1947. The Armory has been at the forefront of art education in southern California for more than 60 years. Classes were led by artists whose teaching concepts grew out of the museum’s exhibitions of modern modern art. Today, we maintain our commitment to providing accessible public spaces for the exhibition of contemporary art and to providing meaningful experiences in art education.